In his previous lesson, Racing for Portraits at the Brickyard, Ian Spanier details how getting thrown into the chaotic frenzy of a NASCAR infield on the weekend of a major race was “not a colossal failure”, and he put it, and that he and his assistant “actually walked out with successful images.” This lesson picks up on other shots of that weekend’s “mess-turned-success” and illustrates how with two Photoflex Extra Small OctoDomes. 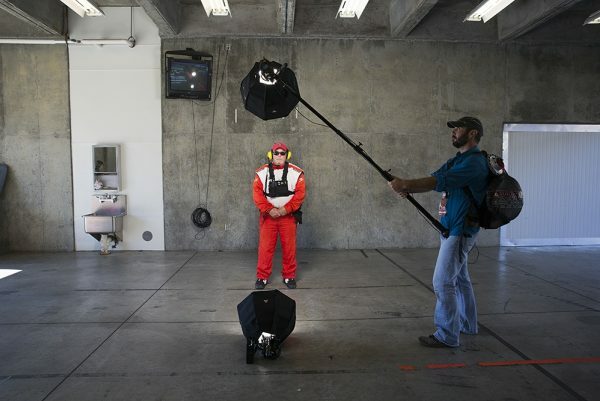 Ian was able to create a consistent series of portraits inside the garage next to pit row. I have to admit that I didn’t intend to make this our set-up for the day. I was shooting some action pictures of the busy garage and pit area as Team Impact members were preparing for the final race day at the Brickyard 400. I had just shot an image of the mechanics working on the #3 car when I noticed a small tour passing behind me. I noticed this great face and quickly signaled to my assistant, Adam, to grab the lights. 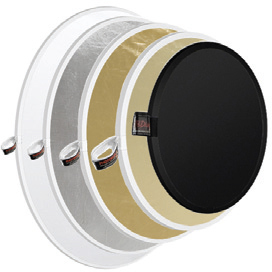 Fortunately, we had mounted the XS OctoDomes to the TRITONFLASH heads and had them on standby. We actually had not known yet what would be possible, as our contact was still working on who we could actually shoot. My first subject was just a fan, and was nice enough to jump off his tour for two minutes for me to photograph him. I only shot four frames. One was a blink, yet I knew I had a good image on the card so I moved on. If you’ve seen my two-minute lesson, you’ll see how this was a new version of that. Now we had a plan for how we would shoot the portraits, and a seemingly good location to shoot them. Keeping in line with Murphey’s Law, however, NASCAR decided that would then be the throughway for ALL the racecars! I did manage to get a nice shot of Danica Patrick’s car passing through as a result, but we lost our location. In a situation like this, being mobile is very helpful. Thanks to the TRITONFLASH units, it was easy to move around. To be safe, I shot some plates of the wall, should I need to later replace the background. We roughly measured our distance from the wall and moved to the next garage. The good news was that most of the walls were pretty consistent. But I was covered just in case we had to move again. We moved to the next garage, and it would be empty up till the race began, so we set our distance and now had our “studio” for the next 30-45 minutes. The set-up couldn’t be more simple and the results were great. I usually look at these kind of set-ups as good for ¾ portraits and tighter, but when I pulled back to make a behind-the-scene shot, I was pleasantly surprised to see that the full length option was also there. To get the nice angle of light (somewhat dramatic, but not too heavy, given how many people wear hats at these events), I coached Adam with the angle of the key light, which was best angled slightly downward. I had both layers of diffusion attached to each OctoDome, as well as a small piece of ¼ CTO gel taped inside each to warm up the light a bit. Notice how Adam boomed the key light directly over the fill light on the floor. Getting subjects to this space was tricky, as the race was about to begin, so we quickly grabbed who we could, including the Team Impact Owners, whose portrait revealed how well these small light sources cover a duo, as with a single subject.